Covered German Apple Cake is one of the best apple cakes! 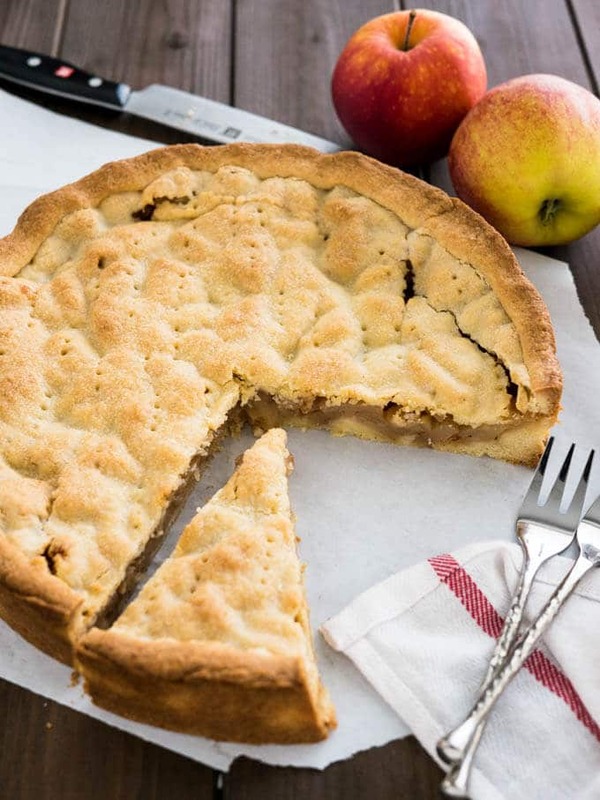 Filled with cinnamon-seasoned apple chunks and topped with a vanilla shortbread crust. You can get this cake in every German bakery! This Covered German Apple Cake is the favorite cake of my husband! In Germany, we call it ‘Gedeckter Apfelkuchen’. The apple filling is covered with a vanilla shortbread crust and that makes the apples inside extra tasty! I also made a German Apple Streusel Sheet Cake a few month ago which has streusel on top and is made with apple chunks and apple sauce. 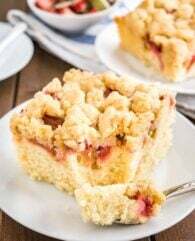 If you love streusel you need to try this cake! 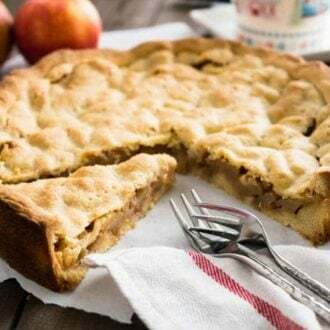 Another great cake with apples is this Pine Nut & Rosemary Apple Butter Cake which is made with a yeast dough and so fluffy. 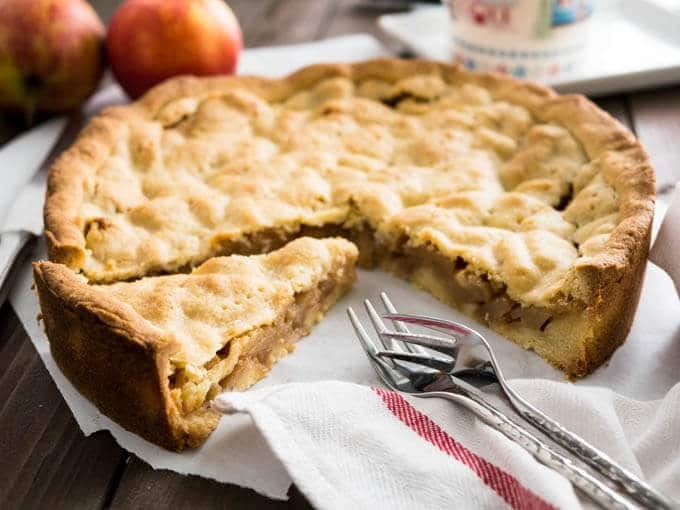 In Germany, you can find many different types of apple cakes. For example with streusel on top, as a sheet cake or with sunken in apples. But my husband loves his grandmother’s covered apple cake. It’s a very traditional German cake and every grandmother has her own little secret which makes her version of the cake special. Peter’s grandmother loves to use rum when she is baking! She uses it with powdered sugar to glaze cookies or to make her apple pie filling extra tasty. Adding rum to the apple cake filling gives it a great flavor. I like to use a gold rum for baking because it complements the sweeter flavors. For this cake, you could also use a spiced rum or a black rum, both go really well with spices like cinnamon. The rum gives a nice little kick without tasting like alcohol! Just add a tablespoon or two to the apples with the cinnamon. Like you see in my photos the cake comes out a little bit flat. During the baking process, the apples will get soft and the filling will shrink. 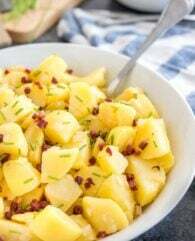 The apples get infused by the spices and form a delicious filling! This cake might not be the most beautiful cake but it definitely tastes like a million bucks. 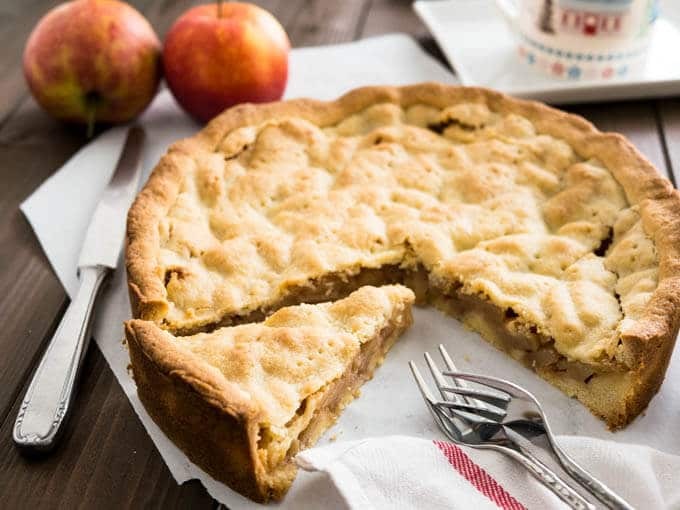 This Bavarian Covered Apple Cake is covered like an American apple pie and tastes delicious, especially with a glass of milk or some vanilla ice cream! You can serve it warm or in the summer it tastes also great out of the fridge. Looking for more German cake recipes? 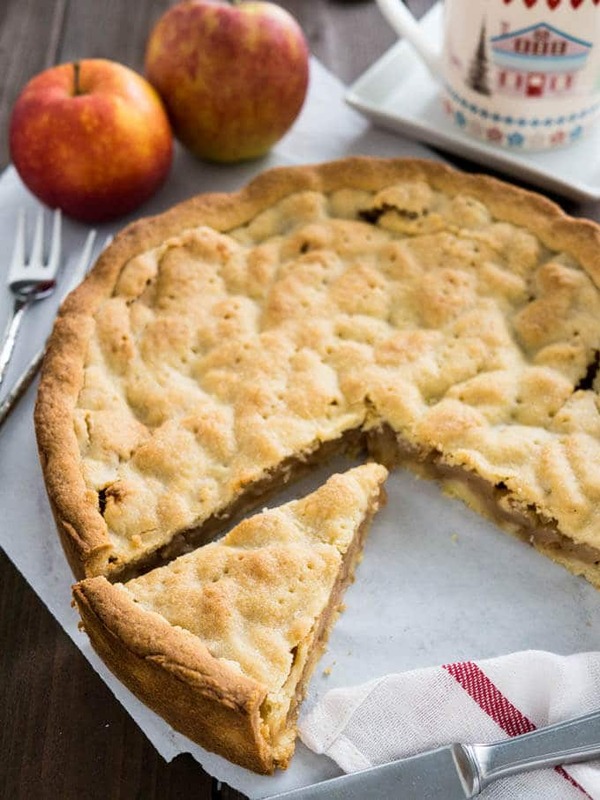 This covered Apple Cake is filled with cinnamon-seasoned apple chunks and topped with a vanilla shortbread crust. You can get this cake in every German bakery! In the bowl of a stand mixer fitted with the paddle attachment, combine flour, 1/2 cup sugar, vanilla extract, egg, and the cold butter. Knead until the dough is smooth, cover and refrigerate for 30 minutes. Peel the apples, and cut them into chunks. In a bowl, combine apples, 1/4 cup sugar, lemon juice, cinnamon, and 1-2 tbsp rum (optional). Preheat the oven to 350F (175C) and grease a 9-inch springform pan (26 cm). Use 3/4 of the dough for the bottom. Roll out the dough into a circle bigger than your baking pan, transfer to your pan and bring up the dough on the sites. Stab the bottom with a fork and sprinkle breadcrumbs on top. Roll out the rest of the dough to make the upper crust. Add the apple chunks to the baking dish and cover with the upper crust. Bake for 50 minutes until lightly browned. Serve still warm with vanilla ice cream or whipped cream. The cake tastes best on the same day. The ingredient list calls for 1/2 lemon juice. Can you please explain what 1/2 lemon juice means? Just got back from Germany, where i have been eating every kind of cake and pastry. Bought myself a German baking book too. About to try this cake now. That looks absolutely heavenly! I love how it’s absolutely bursting with apples, and I can’t wait to try this recipe. This cake is one of my husband’s favorites too from when we were living in Germany. 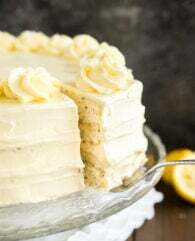 I have tried a few different versions and haven’t been able to recreate the one he loved best from a little bakery in Frankfurt so I can’t wait to try yours because it looks wonderful! Thank you!! Oh, and I meant to ask – do you have a favorite type of apple to use in this? I like to use tart apples. Something like Elstar, Boskop, Jonagold or Cox’s Orange. They all taste great in apple cake! Thank you for your sweet comment, Amy! I hope this version is similar to your husbands favorite. Some bakeries also add rum soaked raisins.